With the 2008 baseball season two-thirds in the books, it’s that time of year for sportwriters, and fans alike, to start speculating on League MVPs, and gathering support for “their guy.” Here at 4HT, the choice was simple, much more so than in years past. Ladies and gentlemen, I give you the 2008 A.L. MVP, Carlos “Mini-Hulk” Quentin. Mini-Hulk has appeared in 100 games for the Sox, playing left field. He has flashed a decent glove in this time, consistently making plays in the outfield. During a series in Kansas City, MH, manically pursuing a deep fly, proceeded to run through the left field wall, puncturing the outfield fountain system’s water pipes in the process. A green, and dripping wet MH returned to the field, and presented the ball to record the out. Missouri was flooded for days after the incident. Mini-Hulk has only missed 3 games this season, all the direct result of a broken hand suffered after a sweep in Detroit led to a rage that left Old Tiger Stadium completely demolished. Chicago is currently in first place, 15 games over .500. You are not valuable, much less most valuable, if your team is in last place or somewhere near the bottom. It is disgraceful to think voters named A-Rod MVP in 2003, despite the Rangers finishing the season 20 games under .500. Hell, Mini-Hulk is the anti-A-Rod, and is most worthy of everyone’s support. MH makes a meager $400 K a year, and spends half of that on bats, since he shatters 3 a game. 27 Home Runs- 1st in A.L. 78 RBI- 2nd in A.L. 74 R- 2nd in A.L. .550 SLG- 5th in A.L. .932 OPS- 5th in A.L. Pair these numbers with a respectable .279 BA, and you have an MVP caliber player. The ability to: Jump 3 miles in one bound, run a 2.7 sec. 40 yd. dash, hold his breath for 36 hours, hit 950 ft. home runs, slide into 2nd base from 1st with no lead-off, bunt 450 ft. home runs, eat 60 hot dogs in 10 minutes, catch a Matt Thornton fastball in his mouth, break 133 cinder blocks with one chop, and, most shockingly, pick up (and hold) Ron Gardenhire for 5 consecutive seconds. 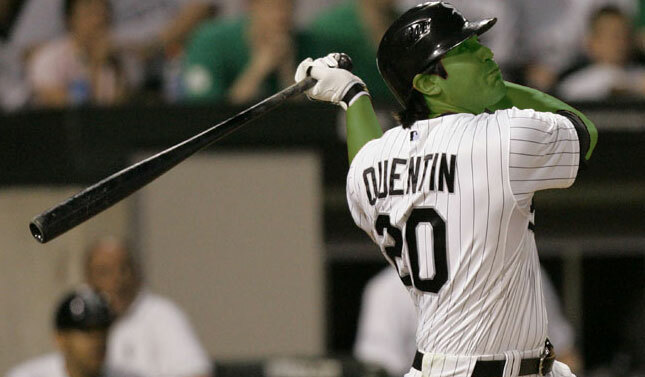 All kidding aside, Mini-Hulk has become the heart of the Sox offense. Dye is having one hell of a year, but #20 has chugged along, proving time and again he is one of the league’s most feared batters. Without MH, the South Side wouldn’t be in first right now, much less frontrunners to win the Central. He brings unparalleled energy to the plate, and his value to the franchise this season has been immeasurable. Mini Hulk’s stats and credentials speak for themselves, and that is why he has my full endorsement as this year’s A.L. MVP. Sure there are “feel good” stories in baseball right now, but lets give the trophy to someone who actually deserves it by having a tremendous 2008 AND helping his team make the playoffs. Carlos “Mini-Hulk” Quentin for MVP…….Please join the campaign! I am currently trying to get Hawk and D.J. in on it, and the more support we give, the better Quentin’s chances are! Mini-Hulk gave shaving cream pies in the faces of Chuck Norris AND Bill Brasky. Incredible Hulk??? It’s incredible to me he hasn’t been busted for HGH yet.